If the recent SPS IPC Drives show is an accurate indicator, the automation industry appears to be shaking off the effects of the recession and is investing in innovation. Once again, the annual SPS IPC Drives show – held in Nuremberg, Germany, in late November – smashed attendance records for both exhibitors and visitors. By the time the three-day event closed its doors, it had attracted 60,027 visitors (up from 56,874 in 2012) who came to see 1,622 exhibitors – 164 more than the previous year. The exhibition expanded into an extra hall, taking the total floorspace to 114,000m2, compared to 106,100m2 in 2012. Although it is still a German-dominated event, non-German exhibitors represented 30% of the total at the 2013 SPS show – a slight increase from the 29% in 2012. The biggest foreign contingents came from Italy, China and Switzerland. The USA was in fifth position with 24 exhibitors, while the UK was seventh with 21 participants. SPS IPC Drives already has a satellite exhibition in Italy, and this will be joined in February 2015 by a new event in Ahmedabad, India. This is designed to tap into the Indian automation industry, which is estimated to be worth $2.2bn at present, and is expanding by around 12% per year. 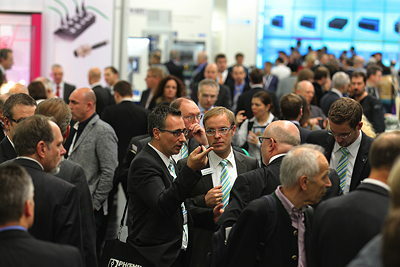 The 2013 SPS show in Nuremberg was marked by many suppliers announcing extensions to existing product ranges, rather than launching breakthrough new technologies. Over the next few pages, we report on of some of the items on show. The German drives and motors manufacturer Baumüller has combined its b maXX 3000 converters with its DSD, DSP and DSC servomotors to create a compact decentralised drive called the b maXX 2500. 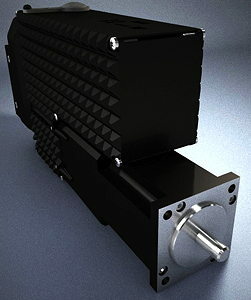 The IP65-protected drives (below) will be available with outputs up around 6.5kW, nominal torque levels of 20Nm, maximum stall torques of 105Nm. They will operate from 760V supplies. Beckhoff was demonstrating a complete servodrive in a standard EtherCat terminal housing that can deliver up to 4A rms, 50V DC. The EL7211 servo terminals include versions that support the single-cable technology used by Beckhoff’s AM8100 servomotors. The Swedish HMI specialist Beijer Electronics, which entered the inverter market a year ago, was showing several additions to its range of inverters. These included “competitively priced” IP20-protected models for use inside cabinets. The DIN-rail-mounting drives are available in ratings up to 11kW. Beijer also offers IP55/IP66 inverters in ratings from 0.75–160kW, with single- or three-phase inputs and options such as filters and power switches. Bonfiglioli has extended the power range of its Active Cube inverters up to 400KW for single inverters, or 1.2MW if three are used in parallel (occupying a panel width of 1,200mm). The drives are available in 400V or 690V AC versions. The Italian company was also showing a new range of active front-ends (AFEs) which feed braking energy back into the power supply. The AEC AFEs (below), which can be configured for sinusoidal or block feed currents, are available in six frame sizes covering ratings from 5.5–400kW.